There wasn't a hint of a croc at Darwin Surf Life Saving's Fannie Bay Swim Classic at the weekend. With so many of the fantastic Surf Lifesaving crew out on the water, they wouldn't have dared. I'm reliably informed it is the safest open water swim around with a ratio of one water safety officer to five competitors!! 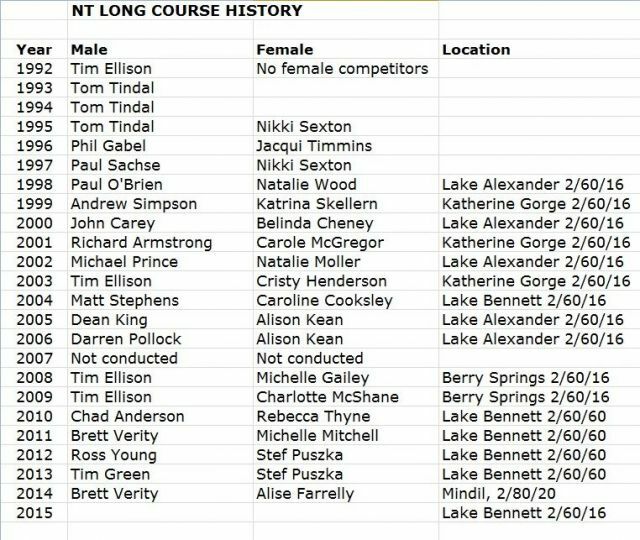 It was perfectly timed and a good hit out for many triathletes ahead of Blue Cycles NT Long Course Triathlon which is taking place on Sunday at Lake Bennett (see below). We need a pretty good idea of catering numbers by this Friday. Please help us with this by going online and purchasing your tickets asap. This weekend's action shifts to Lake Bennett Resort (now with new owners) for 2015 Blue Cycles NT Long Course Triathlon C'ships. The Lake Bennett Resort management are going all out to welcome triathletes and their families with lots of activities available over the weekend. The course is looking great. Don't miss this one - it's a gem on our triathlon calendar. 1. Brian Gallagher & Moira Wigley have intact records (11 out of 11) after successfully completing the 11th annual Fannie Bay Swim Classic at the weekend. 2. Brian Gallagher heads for Bali this weekend to compete in the 5k event of the 6th Annual Bali Ocean Swim. Good luck! 3. 2015-2016 National Calendar announced. 4. Emma Cook paid a flying visit to Darwin at the weekend. 5. Former club treasurer Jane Marie Kerslake was also back in town catching up with friends. 6. Ron Griep racing Holten Triathlon in Netherlands this weekend. Good luck! 7. Photos from Fannie Bay Swim. 8. Good luck Rena Walker - heading to Qld for the Gold Coast Half Marathon at the weekend. 9. Stu Fitch is celebrating after ticking over 19 million metres swum since 1992. 10. Good luck to all our members taking part (individual, team or volunteering) in the NT Long Course. 11. Membership renewals for 2015-2016 have happened for those of you on auto-renew. All other memberships now due, check your inbox for details. Please email if you can fill any of those early blanks.